I would like to start by thanking the MoD for hosting us in this august and historic building, and to Mandeep Kaur, our Sikh chaplain to the armed services for her hard work organising the function. Vaisakhi is a traditional spring festival in northern India celebrating the gathering of the winter harvest, and, like spring festivals everywhere, a time for new beginnings. Appropriately, the spring festival of Vaisakhi was chosen by Guru Gobind Singh to formalise Sikhs as a community of equals, ready to stand on its own without the guidance of further living Gurus. History records that on that historic Vaisakhi day in 1699 he tested the resolve of Sikhs, to stand up and be counted and be ready to give their all upholding the egalitarian teachings of Sikhism, no matter how daunting the challenge. Today, many question the need for a visible identity? It’s divisive, why cannot you simply live by the principles of your faith; without a distinct identity? It is a question that is best answered by a question. Why do the clerics, members of the Salvation Army or members of the armed services have a distinctive identity or uniform? The reason is that the dress or uniform reminds us and others, of a code of behaviour to which we are expected to adhere, and hopefully deters us from behaviour that might bring the uniform into disgrace. Nearly a century before Voltaire, Guru Teg Bahadhur gave that noble sentiment courageous utterance, by standing up for the rights of the Hindu community; those of a different faith to his own. The Mughal rulers challenged Sikhs in the crowd (who then had no distinguishing appearance) to come forward and claim their master’s body. Sikhs, cowed by fear hesitated to do so and the body was removed by stealth, itself an incredibly brave action. 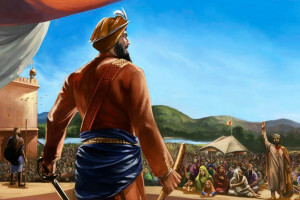 It was this incident that years later, led The 10th Guru, Guru Gobind Singh to resolve that in future, those who called themselves Sikhs must be ready to meet the most daunting of challenges. Though the cause of evil prosper yet tis truth alone that’s strong. The hymn also reminds us that despite difficulties, with true commitment and faith, each one of us can all help turn what is described as ‘the iron helm of fate’. We are all unique individuals confronted with varying ethical challenges in the course of our life, and with and opportunities to make a difference and work for a fairer world. A tiny personal example. I grew up in England and first went to India in the early 60s as a newly qualified mining engineer. At the time, all States in India were allowed to have their own regional language except Punjab, where Punjabi the language of the Sikh scriptures was being replaced by Hindi. Sikhs were angry and upset by this deliberate discrimination, but had no media voice. I thought that this was unfair—worse, not a British or Sikh view of fairness! I knew a letter in the national dallies from a Sikh would never get published, so I took on the name of a pompous neighbour in England, Victor Pendry. A legacy of Raj deference ensured that my highly critical letter was published in a national daily, causing a stir in the Sikh community. My wife knew of Mr Pendry before she ever met me. A letter supposedly from my old Head, Sylvanous Jones followed supporting Mr Pendry. Using a telephone directory, in my first interfaith initiative, letters from Hindus and Muslims rapidly followed drawing attention to the injustice against the Sikhs. The point of the story is that in different ways, we can all make a difference by standing up to political injustice, or perhaps in combatting bulling at school or the office or workplace, and in a constant striving for greater social or political justice. And there is much to do. Today materialistic secular society has pushed religion to the margins of society as irrelevant. In a debate in the Lords, a member commented ’religion is out of step with society’. I responded that to me, it was like someone saying ‘my satnav is not following my directions’. Religion is often blamed as a cause of conflict. It is not. It is the misuse of religious sentiment to promote irreligious ends. Religions are ethical satnavs to lead to an understanding of right, wrong and responsibility, while politicians are increasingly tempted to pander to our material desires in their attempt to win votes and allegiance. It is not easy to go against this materialistic tide with its unthinking pursuit of individual happiness to the neglect of responsibility, but the message of Vaisakhi is that Sikhs have a duty to help move society to towards more ethical or gurmukh living. Sikh teachings suggest that that we all fall into one of three groups, distributed in a bell shaped curve, which statistician s call a normal distribution. Physical attributes like height and weight all fall into such a distribution. It’s the same with ethical or moral behaviour. At one extreme there are the mamukhs, those who selfishly only think of themselves and are prepared to lie and cheat and even kill to achieve their ends. Then there are those in the greater middle of the curve or distribution; peacefully trying to lead their lives, but rarely looking beyond themselves, and then a smaller group, the gurmukhs, selflessly trying to make the world a better place. Our Gurus required us to go beyond lip service to Sikh teachings, and to live those teachings, taking an individual as well as a collective stand injustice against any individual or group. We can all make a difference. The message of Vaisakhi is to remind us of our potential, duty and responsibility to work for the improvement of society by working for a fairer and more peaceful world. It is an uplifting message that should determine our action and reaction to the world about us.